In 1927, the same year Venice officially was incorporated as a city, Everett, Washington paper mill owner Alvah Jordan built a paradisiacal winter estate on 2.8 tropical bayfront acres in Nokomis on the shore of Dona Bay. The gracious four-bedroom, 4,140-square-foot Mediterranean-style estate sits on 156 feet of bayfront at 218 Pocono Trail, adjacent to the county’s wooded public Pocono Trail Preserve. 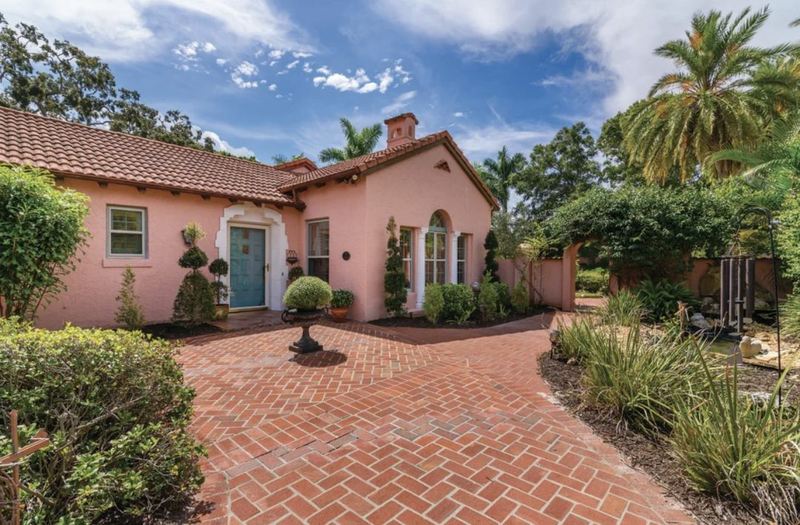 Surrounded by a pink wall flanked with royal palms, it has a saltwater pool, three large banyan trees and “a beautiful live oak I call the grandfather of the property,” says current owner Carol Hall. 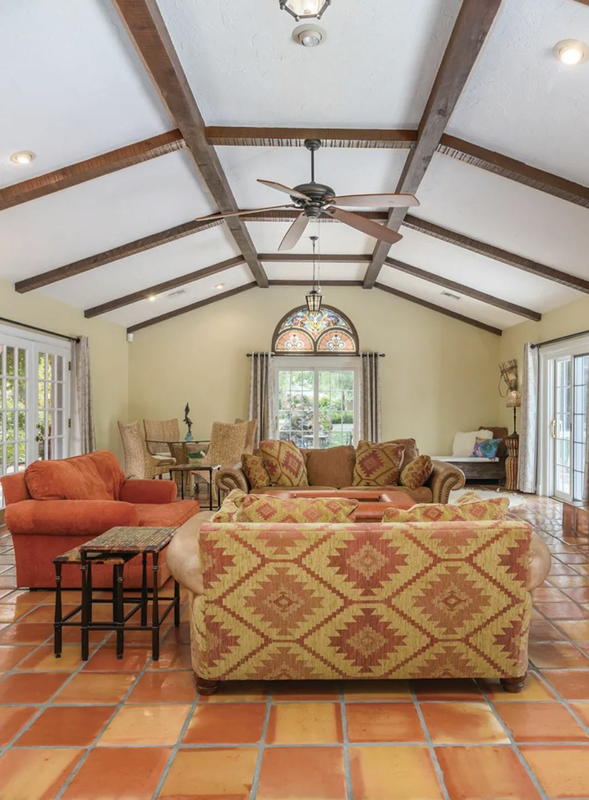 Hall, a holistic health nurse, christened the estate Villa Terra Mar—House of the Land and Sea—and spent two years restoring it in a period style for possible use as a holistic health center. The 1925 guest cottage on the property still has its original heart pine floors, for example. Hall installed new air-conditioning and hot water heaters, updated the interiors in keeping with the period feel of the home (she kept the original stained-glass windows), and added a prayer garden and a walking labyrinth, “a walking meditation,” she calls it. But finding herself too far away from new grandchildren in other parts of the country, she has now put it on the market for $2.289 million. The real estate market in Nokomis is “an interesting mix of newer construction and, like this one, interesting properties that have been in families for generations,” says listing agent Joel Schemmel. 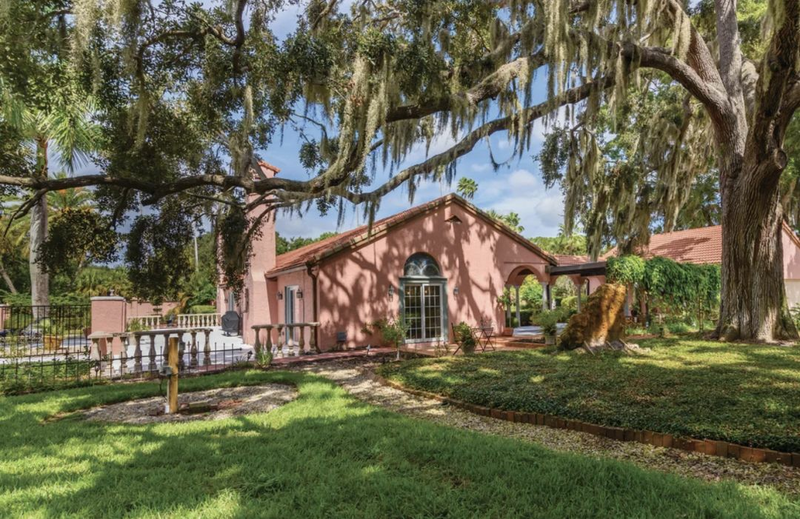 It’s still possible to find larger old estates on five or even 10 acres on the Intracoastal Waterway side coming on the market. “To get that size lot in Sarasota is prohibitive; well, you really can’t get it,” Schemmel says.